As they are artificial flowers we aim to deliver flowers a minimum f 2-3 weeks prior to the wedding date. Yes Bridal flowers & packages can be delivered worldwide. As they are artificial flowers your flowers will become a keepsake. We aim to create a unique look for each bride with there style and them in mind. Most importantly we don't cut corners all our products are professionally made with the utmost care and attention to detail. We can create bouquets our of artificial flowers, origami, fabric, brooches, buttons and more. With custom orders we recommend a minimum of 3 months in advance, the more time we have to prepare the more likely we will have your chosen flower stems in stock, in saying that we have been known to pull rabbits out of has for those that have last minute issues with other suppliers, so it never hurts to inquire. Otherwise we always have a range of beautiful bouquets available for purchase in our Online Store. With custom orders we take a 50% deposit to secure all the required stems in preparation for the assembling of the design. 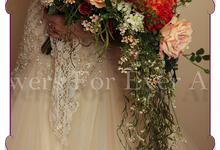 We are a family owned and operated Artificial Wedding Flower design business. We pride ourselves on our original and high quality designs. 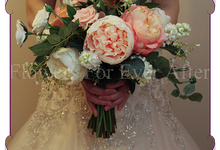 Every bouquet, arrangement, boutonniere, corsage is crafted with skill and love. We aim to create the perfect bridal package for each bride and make sure that it completely reflects the person who will be carrying it on the day. Our online store has products currently available for purchase and Custom Orders are welcome. We can and have shipped worldwide!